Open and spacious, this ranch floor plan offers a private master suite boasting a spa bathroom with oversized walk-in closet, freestanding soaking tub, and separate "his" and "hers" vanities. Furthermore, two identical secondary bedrooms with a shared bathroom offer views to the rear and are ideal for growing families. The impressive vaulted great room is open to the dining room and chef's kitchen making it a top choice for families that love to entertain. Beyond the kitchen, an open utility room features a large laundry area with ample folding counters, mud room bench and hooks, and a walk-in pantry. Off the great room, open railing stairs lead you to an unfinished storage space on the second floor that can be converted into an additional bedroom, or the optional basement foundation. 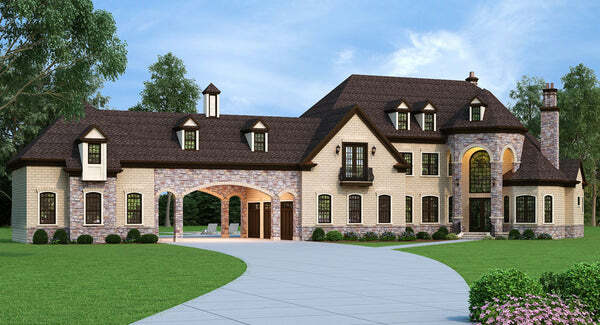 The opportunity for entertainment in this 2,800 square foot house plan doesn't end indoors. A large vaulted covered porch and sprawling decks encourage outdoor living with views ideal for lake lots, or those with stunning views. Last, but certainly not least, an unfinished in-law suite with private living room, kitchen, and covered porch can be utilized for multi-generational families. This in-law suite is a short distance from the garage and offers a private front porch. 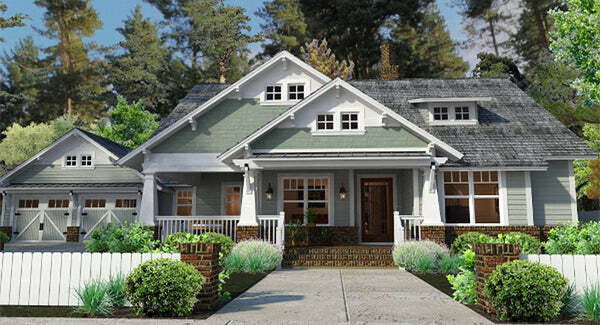 This craftsman floor plan lives big in under 1,900 square feet! A large wrap-around porch leads you directly into the foyer with direct views into the vaulted family room and spacious lanai. This open floor plan layout boasts an oversized kitchen and cozy dining area that comfortably seats six. The laundry room off the kitchen makes multi-tasking an easy everyday task. Adjacent to the garage is an optional staircase to the basement. In lieu of basement stairs, this optional space can be converted into a mud room with lockers and a bench. The master suite beautifully frames views to the rear and provides plenty of natural daylight. Separate "his" and "hers" walk-in closets lead you into a spacious master bath. The bathroom features a luxurious soaking tub, separate sinks, and large walk-in shower. Finally, the versatile study at the front of the home can be used as a personal or business office and is accessible from the foyer or swing porch giving guests direct access without the need to traverse the entire house. There is no denying the elegance of this luxury floor plan. The Lady Rose is inspired by European architecture. This unique design that will stand out on any property. A towering front porch opens into an angled foyer and draws your eye to the stunning curved staircase. Beyond the stair hall, a two-story great room offers floor to ceiling views. The gourmet kitchen is without a doubt the star of this home. Its bright, kitchen boasts two kitchen islands, abundant cabinets for storage, and large windows that provide plenty of natural daylight. Directly adjacent is the formal dining room accessible from the main stair hall, and a separate family entry tucked away behind. Privately tucked away on the right wing of the house is the immense owner's suite. You'll enjoy an oversized soaking tub and walk-in shower, along with "his" and "hers" sinks, and a spacious makeup area in the spa master bath. It's no secret one of the most impressive parts of this suite is the enormous 10x11 master wardrobe which features a packing island and stackable washer and dryer. Finally, on the second floor of this luxury floor plan are 3 secondary bedrooms each with a private bath. A home office overlooks the dining room and is the perfect nook for homework or everyday tasks. If outdoor living is at the top of your list you will fall in love with the Pleasant Cove. 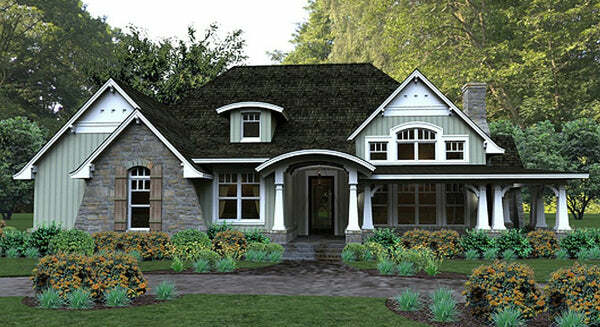 This charming ranch house plan impresses with its wrap-around porch and craftsman architectural details. Beyond the front door a large vaulted family room with cozy fireplace creates the perfect space for family and friends to enjoy. At the rear of the home, the chef-inspired kitchen features two kitchen islands. Plenty of counter prep area, and ample storage make the kitchen the gem of this home. The open dining room adjacent to the kitchen provides clear views to the lanai and outdoor grill. The private secondary bedrooms each feature a private bathroom and walk-in closet. As an added bonus, this cozy home features a spacious workshop in the garage. The huge bonus room directly above ideal for playtime, movies, or crafts.